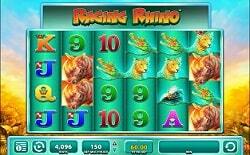 WMS Gaming’s Raging Rhino has been nothing short of an outright success for the casino software provider. Raging Rhino is themed on the African savannah and contains far more than rhino symbols upon its reels. Expect to find a host of cheetah, crocodile, and gorilla symbols, as well as the customary high playing card symbols in this slot. One of the main reasons for Raging Rhino’s rapid success and popularity could be the fact that it can dish out over four-thousand paylines at times. WMS Gaming have a unique way of developing original gaming engines for the vast majority of their online slots. Most of their games have also been cult successes in the land-based casino world before making their way into the online casino world. Raging Rhino is no different. WMS Gaming have created a wonderful Any Way Pays gaming structure and engine for this game, ensuring that there really is nothing quite like it, either in their library or in any other software developers’ collection. With a total of 4,096 paylines present on the reels of the Raging Rhino slot, there was never going to be any way in which players could alter the number of paylines they play with. They can, however, alter their bet multipliers. These stem from a floor of 1 up to a ceiling of 150, and players will note that this alters their total bet from 40p per spin, up to £600 a spin. The rest of the wagering menu is basic, consisting of a spin button and providing access to the paytable. Note that six reels in this slot, instead of the customary five. This has been done to accommodate such a massive array of paylines. Wild symbols: The savannah landscape is quite prominent on the reels of this slot since it acts as a wild symbol. Wild symbols can crop up on the second, third, fourth and fifth reels of the game, and they can substitute for any other symbols barring feature icons. Feature symbols: Diamonds may look out of place in the Raging Rhino slot, but you won’t care a jot about that when they deliver you a special bonus round. They can do this when they appear 3, 4, 5 or 6 times anywhere on the reels. Players will also pocket scattered wins when 3 or more diamond symbols appear on the reels. Free spin bonus: Players will start the free games feature with 8, 15, 20 or 25 free spins, depending on whether they landed 3, 4, 5 or 6 scatters in the base game. During the feature, it is possible to win additional free spins with the scatter, and any wild appearing in a winning combination can double or triple the value of that winning combo. 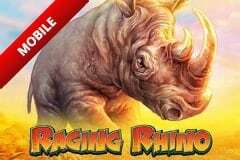 With a theoretical return to player rate (RTP) of 95.91%, and a massive 4,096 paylines to bet on, wins are frequent in Raging Rhino. The best paying symbols are not actually standard paying icons, but feature symbols. These scatters can see you win 1,000x your total bet if you are fortunate enough to land 6 of them in any positions on the reels during a single spin. Raging Rhino is a force to be reckoned with. No other slot (to our knowledge) can offer you as many ways to win for as cheap a stake as this one. WMS Gaming have gone above and beyond, turning what should be an ordinarily African savannah themed slot into the global goliath of a game that this is. We strongly recommend every player to give Raging Rhino a spin if they come across it.